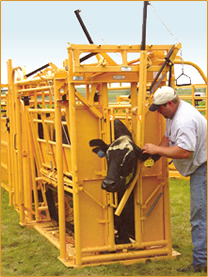 We carry a large supply of gates, chutes and corral panels. Our products are made with a heavier gage steel than what is normally carried at other places. This simply means that our gates, chutes and corral panels will last much longer and withstand much more. For-Most Model 125 Cattle Chute w/Self Catch Head Gate - Call for current pricing. We Carry The Best Selection in the Area! Copyright © 2016 - Last Modified: August 24, 2016. All rights reserved.